Mitsubishi Electric’s MELSERVO MR-J4 used in the PACKAGING DEL SUR packaging machines. Photo by Mitsubishi Electric Europe. 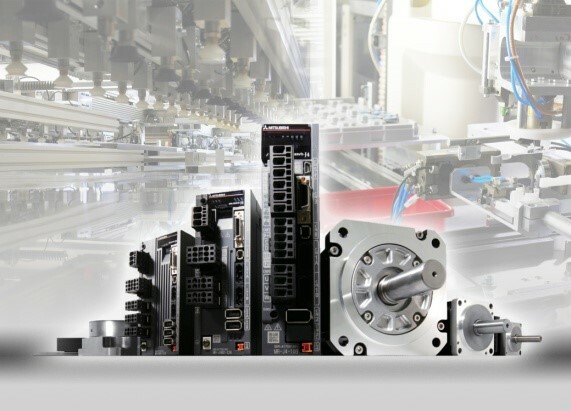 B.V.
Mitsubishi Electric is a world leader in the three principal application areas for servo drives in industrial automation: robotics, CNC and general motion control (GMC). Mitsubishi manufactures its own technologies in all of these fields, something which very few other manufacturers can match. Combining this capability with unmatched service results in control solutions enabling the construction of the highest quality machines and systems. All these technologies can be seamlessly integrated onto one single controller platform, the MELSEC iQ Platform, combining a PLC CPU with a robot CPU and a motion CPU, along with an MES IT module to provide direct connection to higher level business systems such as SAP – an integrated solution that is unique throughout the industry. What were once simply individual control components become fully integrated systems with synchronised scanning cycles. Recently introduced products include the new MR-J4 series of servo-drives and matched servomotors, with features such as a 22-bit absolute encoder, a frequency response of 2.5kHz, and the inclusion of a double vibration suppression filter. These features help machinery manufacturers to develop machines with reduced positioning times and reduced cycle times, meeting the production requirements of customers. Greater production flexibility is a further requirement, which translates into an increased number of axes to be controlled. To meet this need, Mitsubishi Electric uses a full duplex 150Mbps fibre optic bus, which simplifies connection and commissioning and permits multi-axis co-ordination in synchronous machines, allowing the control of up to 96 axes with the Q173DS controllers. For example packaging machine manufacturer PKS develops end-of-line solutions that meet the latest market requirements. In the ten years since its formation, PKS has built its reputation on constant innovation, meeting customer requirements for production lines that meet the needs of ever changing markets, where companies face an ongoing challenge to develop new products and styles of packaging. This is true not only in primary packaging, but also and perhaps more importantly in secondary packaging and palletisation. Chains with rollers in the links for robust anchorage of power elements (folding fingers in box fillers, box, tray, pack conveyors, palletizer shutter rollers, etc.). A Mitsubishi Electric servomotor for each axis, with grease-free stainless steel planetary gearboxes and pressure couplings. The mechanical components are simplified and the use of pneumatics is confined to secondary or safety functions. The basic construction of the machines is in stainless steel. Simple maintenance, with all the components being standard and easy to source market. Programming of the drives is carried out from the central Mitsubishi Electric Q-Motion controller, enabling the operator to replace one damaged servo drive with a new one, just by setting a switch in the front panel display. The backward compatibility of Mitsubishi Electric products and their worldwide presence supports the key demands of PKS. For example, the new MR-J4 series servos can be configured in exactly the same way as the current MR-J3 series. From an innovation point of view, flexibility is of the greatest importance, impacting on the design of every aspect of the machine, both in hardware and especially in software. As an example, the PKS IBER60C wrap around box filler has 16 absolute Mitsubishi Electric servomotors with angular planetary gearboxes, which control the process from the separation of entry lines and gathering of products into groups to the filling of the box, folding or the optional fitting of a cover. Thanks to a form type interface on the integrated 10.4” touch screen, the user can control the different machine formats. Adjustment in operation is also possible, for example by de-phasing the corresponding axis and memorising the change, without needing to stop or to empty the machine. In the development of the machine, PKS addressed the requirements of a wide range of packaging formats, ranging from 3×2 groups of 1 litre cartons to ½ pallet trays (800x600mm) with 185mm flaps. PKS can even look at repurposing existing machines at a customer’s plant, for example by converting a “tray filler” (tray only) into a “wrap around” so as to be able to pack with it a low tray, high tray, open box, open box with “cover” and “wrap around” box. A heat shrink film and tunnel module can also be included in order to configure a “COMBI” version. Staggered grouping on open trays with high production is also possible. When we talk about the speed of a machine, what we are looking at is its production capacity. Of course this means a high production speed, but also a minimum changeover time from one product to another. PKS has developed both qualities to high levels, and is keen to stress that the true cost of the machine is a relation between price and productivity. The use of motor control technologies has a very large effect on the denominator, whilst it does not have as high a relative impact on the numerator, so that in practice the cost of a 30 boxes/minute box filler does not differ greatly from one offering 60 boxes/minute. The PKS ALCO PAL F Palletiser System consists of a mosaics grouper with eight Mitsubishi Electric servomotors and a handling capacity of 90 packs per minute. The grouper has the capacity to move and to rotate each pack as a function of the layer mosaic, while it accompanies the product with an electronic synchronous coupling system. This is followed by the palletizer which has seven Mitsubishi Electric servomotors and can handle up to eight layers per minute. The line production rate can be estimated with these details, but what about the impact of the changeover time for different formats? On many machines, that could be considerable downtime, which impacts on overall productivity. By contrast, on the PKS machines, the change is simply made by the operator from the HMI screen. For more information, please visit http://eu3a.mitsubishielectric.com/FA .